Earlier this week the New England Journal of Medicine tweeted a photo of what looked like a beautiful piece of bright red coral to their 545,000 followers. But it wasn't a piece of coral, or even something doctors had removed themselves - it was an intact, perfectly formed blood clot cast that a patient had spat up after "an extreme bout of coughing". In a medically-worded tweet, the NEJM explained what happened. "A 36-year-old man was admitted to the ICU with an acute exacerbation of chronic heart failure. 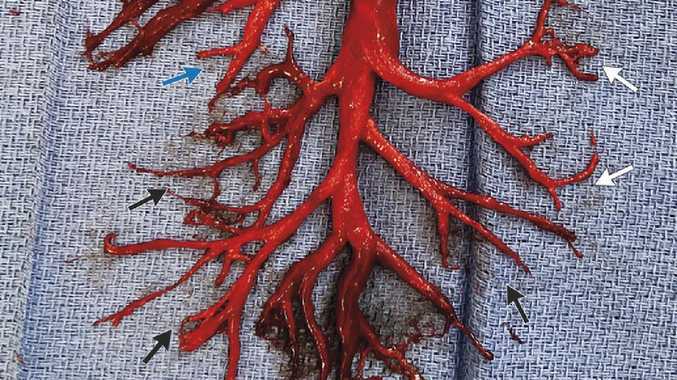 After a ventricular assist device was placed and anticoagulation therapy initiated, haemoptysis developed, and he expectorated a cast of the right bronchial tree," the journal wrote. In other words, the man was rushed to hospital with chronic heart failure and to help his heart, doctors at the University of California - where the man was admitted - connected him to a machine designed to maximise blood flow around the body. The pulmonary surgeon caring for the 36-year-old told The Atlantic the patient then needed further care. "You have high turbulence inside the pumps, and that can cause clots to form inside," Dr Georg Wieselthaler said. "So with all these patients, you have to give them anticoagulants to make the blood thinner and prevent clots from forming." The anti-coagulants the man was taking forced blood out of his pulmonary system and into his right lung. After days of coughing up tiny blood clots, the man eventually - much to his relief - spat up a cast of his right lung's bronchial tree. "During an extreme bout of coughing, the patient spontaneously expectorated an intact cast of the right bronchial tree," the journal explained. Dr Wieselthaler carefully spread out the coughed-up clot, realising it was the perfect shape. "We were astonished," Dr Wieselthaler said. "It's a curiosity you can't imagine - I mean, this is very, very, very rare." While doctors still aren't 100 per cent sure how the clot stayed completely intact on its way up the man's throat, Dr Wieselthaler suspected it was because the man had more fibrinogen in his blood. Fibrinogen is a type of protein in the blood that works to glue platelets together. Sadly, a week after the man coughed up the clot, he died due to complications from heart failure despite being fitted out with the ventricular assistance device. Doctors working at the hospital said the man instantly felt better after coughing up the clot but the size of it suggested the 36-year-old's condition was severe. 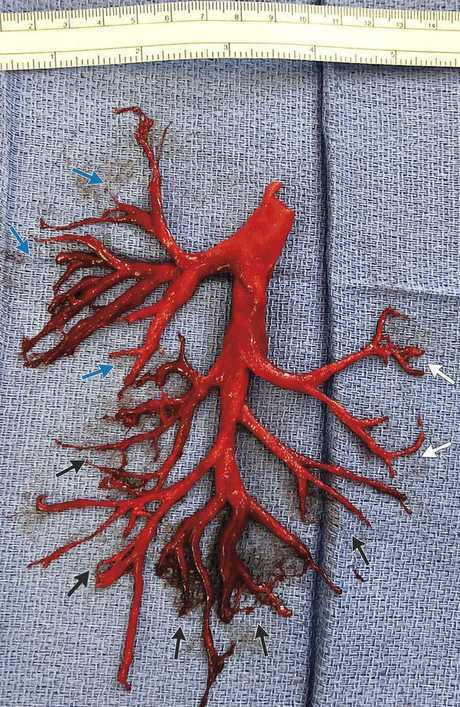 In 2005, a heavily pregnant woman coughed up a similar but smaller bronchial tree clot. The 25-year-old mum went on to recover fully and delivered a healthy, full-term baby soon after.